Be captivated by a wonderful journey into the heart of perfumes and aromas. The Hotel Mondial am Dom Cologne has arranged a special trip for you into the perfume empire, namely the oldest perfumery in Germany! with a history dating back to up to 300 years. As a special reminder of your trip to the museum, you will receive your own perfume in a special flacon mirroring the original flacon design from 1709. Welcome to the heart of Cologne! 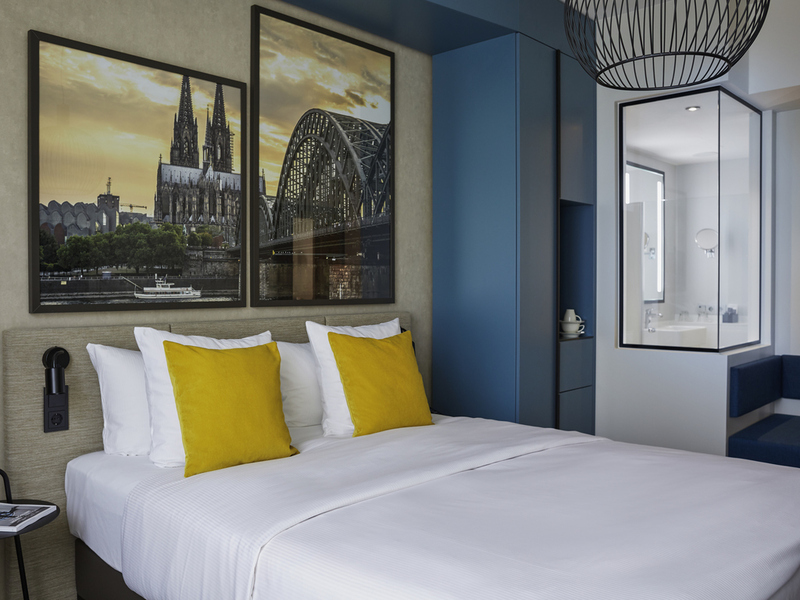 The Hotel Mondial am Dom Cologne MGallery by Sofitel combines the warmth and lifestyle of Cologne with a timeless elegance. Enjoy the luxury of being at the very the center of the action. Memorable moments made in Cologne!.. Enjoy the famous local Reissdorf Kölsch beer in the restaurant and stylish modern bar. On sunny days, relax on the leafy summer terrace of the "Reissdorf im Mondial". From this central hotel, you can explore Cologne's lively pubs and shopping streets, which are within easy walking distance. In front of the Hotel Mondial am Dom Cologne MGallery by Sofitel, the city is at your feet. The hotel is flanked by two museums, with Cologne cathedral rising majestically behind. The banks of the Rhine are just a few steps in the other direction. The charming city of Cologne, where modern architecture goes hand in hand with ancient monuments and churches, is ideal to explore on foot. Discover the history of perfume-making, the famous Christmas markets and the Kölner Philharmonie concert hall. The Hotel Mondial am Dom will whisk you away to the exquisite world of perfumes. Germany's oldest perfumery, founded in 1709, has prepared a special welcome for MGallery guests. Discover the secrets of its scents with an exclusive private tour. Amidst a host of vials, distillers and aromatic oils, you will discover the fascinating history of perfume-making in Cologne. At the end of the tour, you will receive a special gift of an antique replica vial containing your favorite scent. Follow the signs for Zentrum (center), Hauptbahnhof (main train station) and Dom (cathedral). At the station, turn right into the tunnel system following Museen (museums); turn left at first set of traffic lights and then right. The hotel is 219 yards (200 m) along on the right. The hotel has 203 modern rooms, as well as 6 exclusive suites in a classic modern style. Each room has a safe, individually controlled air conditioning, a luxurious bathroom, WIFI and international satellite television. 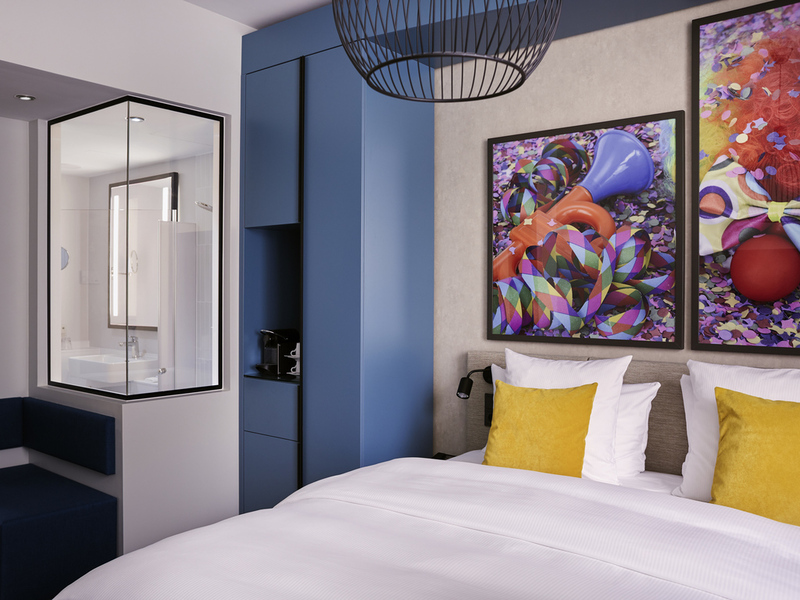 The six junior suites feature impressive large bathrooms in a contemporary style and unique views of the cathedral, the Philharmonie or the peaceful courtyard. Treat yourself to a luxurious bubble bath or replenish your energy in the walk-in shower. Comfortable Classic Room (172 sq. ft/16 m2) featuring premium facilities with air conditioning, safe, WIFI, LCD TV with Sky. Bathroom with large shower or bathtub. Elegant Superior Room (172 sq. ft/16 m2) with breathtaking view of the cathedral and additional benefits: free WIFI and free use of the Nespresso machine. Air conditioning, safe, LCD TV with Sky. Bathroom with large shower or bathtub. 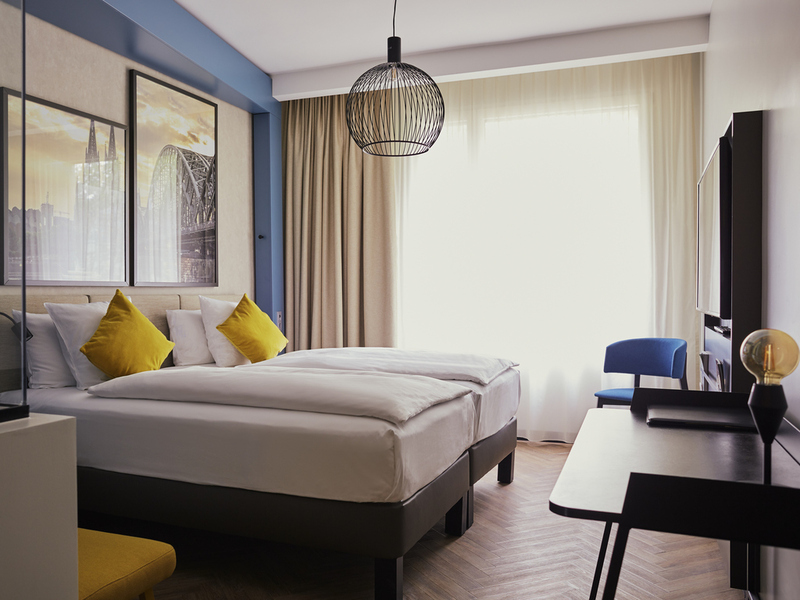 Enjoy more room in this spacious Deluxe Room (247 sq. ft/23 m2) with a separate seating area and large bathroom. Free WIFI and free use of the Nespresso machine. Air conditioning, safe, LCD TV with Sky. We serve international and local meals and drinks around the clock. Baby bed /Free and on request. Let the team in our "Reissdorf im Mondial" restaurant spoil you with regional delicacies at lunchtime or in the evening. Enjoy a varied buffet breakfast in the morning in the "La Brasserie" breakfast restaurant. Enjoy regional delicacies with a breathtaking view of the cathedral from the bar of Reissdorf im Mondial. In the "Reissdorf im Mondial", regional dishes and draft beer are served in the ambiance of a modern Cologne brewery setting overlooking the cathedral. We are open daily from midday to 1am. At the "Reissdorf im Mondial" you can enjoy regional dishes and draft beer in the setting of a modern, Cologne brewery with a view of the cathedral. panel with a touch screen for operating controls, modern presentation equipment and separate coffee-break areas. An additional room with a 184 sq. m of space can accommodate up to 150 people, providing an excellent setting for any event or occasion. Plan your dream wedding reception in a highly personalized and romantic setting in the center of Cologne. The hotel is in the perfect location, within walking distance of the City Hall, the Registry Office and Cologne Cathedral. The Hotel Mondial am Dom MGallery Cologne by Sofitel is located at the heart of the old town in Cologne and features a paid parking deck. In the Cathedral View Suite, you can enjoy a unique panoramic view of Cologne Cathedral and the city skyline from a luxurious bed. With its spacious walk-in shower and separate bathtub, this romantic sanctuary offers the largest bathroom in the building. Refresh your mind and body in our stylish 180 sq. m fitness and well-being facilities. Relax in the steam room or sauna, or indulge in a massage (extra charge). Get moving and get fit by taking advantage of our fitness room. 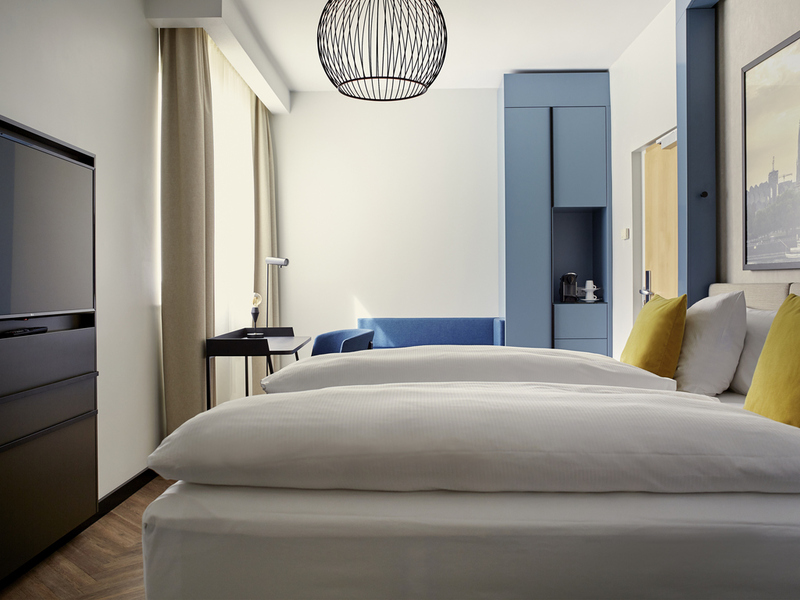 Look forward to an unforgettable stay in the heart of Cologne. Enjoy a Kölsch beer in our brewhouse, set in modern surroundings with a view of Cologne Cathedral, or relax in the SPA area. We will be happy to recommend a number of leisure activities to enjoy during your stay so that you can explore Cologne however you want!